ALLARD -Planisphaerium Terrestre Sive Terrarum Orbis. . .
ALLARD, C. - Planisphaerium Terrestre Sive Terrarum Orbis. . .
Planisphaerium Terrestre Sive Terrarum Orbis. . . - ALLARD, C.
Title : Planisphaerium Terrestre Sive Terrarum Orbis. . ..
Map maker : ALLARD, C.. Size : 20.5 x 23.4 inches. / 52.0 x 59.5 cm. Description :Decorative double hemisphere map of the world, surrounded by additional hemispheric projections of the world. One of the earliest maps to abandon the baroque style of the 17th Century for a more scientific appearance. Shows California as an Island, incomplete coastlines for Australia and New Zealand, continuous land mass from Asia to the Northwest Coast of America and many other contemporary geographical misconceptions. Allard's innovative style was copied by a number of other mapmakers, including Schenk, Zürner, Homann and Seutter. 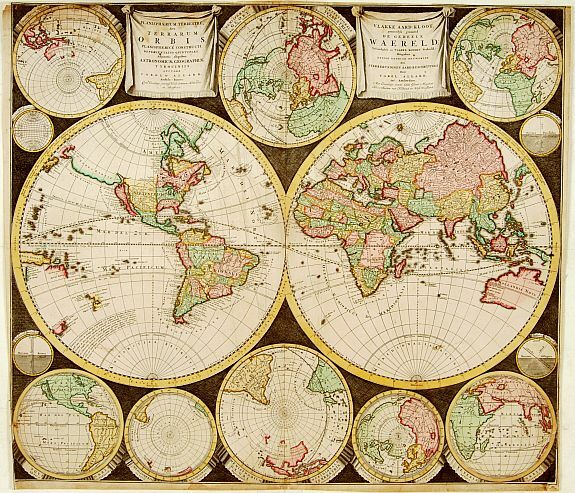 A visually striking example of this scarce and important map. Condition : Very good, each of the four corners underlaid with paper, due to some missing image, care fully re-drawn.